The Open University of Tanzania was established by an Act of Parliament No. 17 of 1992. The Act became operational on 1st March, 1993 by publication of Notice No. 55 in the official gazette. The First Chancellor was officially installed in a full ceremony on 19th January, 1994. 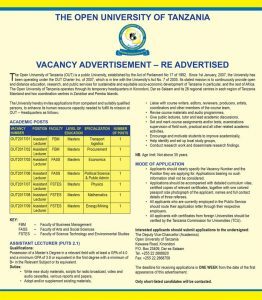 Act No.17 of 1992 has now been replaced by the Open University of Tanzania Charter, effectively from January 1st, 2007, which is in line with the University Act No.7 of 2005. The Open University of Tanzania is the first university in the whole of the East Africa region to offer educational programs through Open and Distance Learning mode. This makes OUT peculiar from conventional residential universities. Through Open and Distance Learning, OUT allows flexible learning environment leading to protracted periods of course completion. OUT offers different academic programs which are certificates, diplomas, degrees and postgraduate courses. Educational Delivery is attained through various means of communication such as broadcasting, telecasting, Information and Communication Technologies (ICT), correspondence, enhanced face to face, seminars, contact programs or the combination of any two or more of such means. Read the attached document below..